Growing up in Texas, my husband is a huge fan of Mexican food. He always gives me a hard time because I am such a wimp when is comes to spicy foods. We just didn’t eat much spicy food in Boston. So this dish is a compromise between the two of us. I am sure my husband will drop a ton of hot sauce on his before eating. 🙂 Hope you like it. Cook the rice according to the instructions or in the rice cooker and set aside. I only purchase dry beans, so they were soaked over night and then boiled and rinsed to soften before I started. In a large skillet, heat the oil under medium high eat. Put the stalk part of the green onion in the oil and let it sit for about 30 seconds allowing the onion flavor to infuse in the oil. Next, add the pepper, shallots, and garlic and let cook for another 5 minutes. Afterwards add the beans and spices and let cook for about 5 – 7 more minutes stirring often. 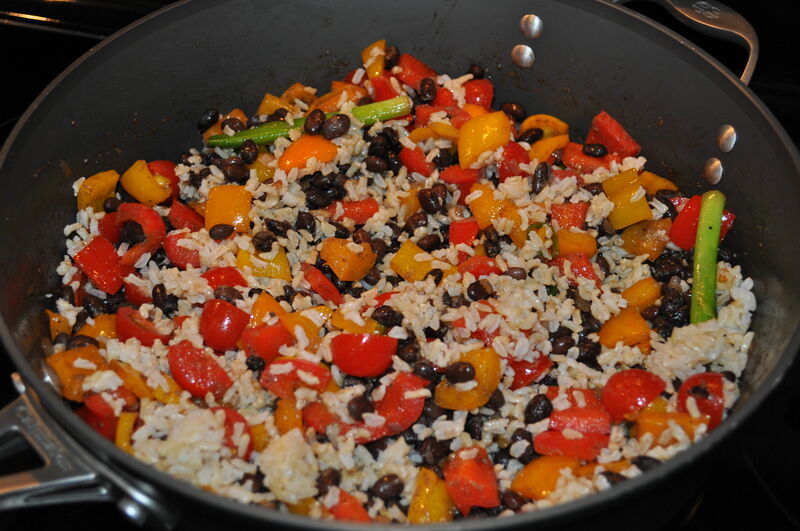 Add the rice last, stir, and remove from heat. 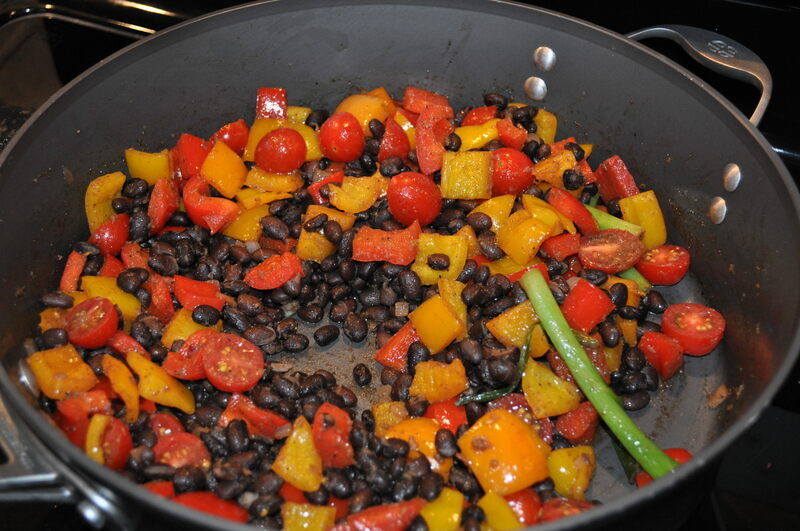 Before serving, add the cold sliced tomatoes with the warm bean mixture. 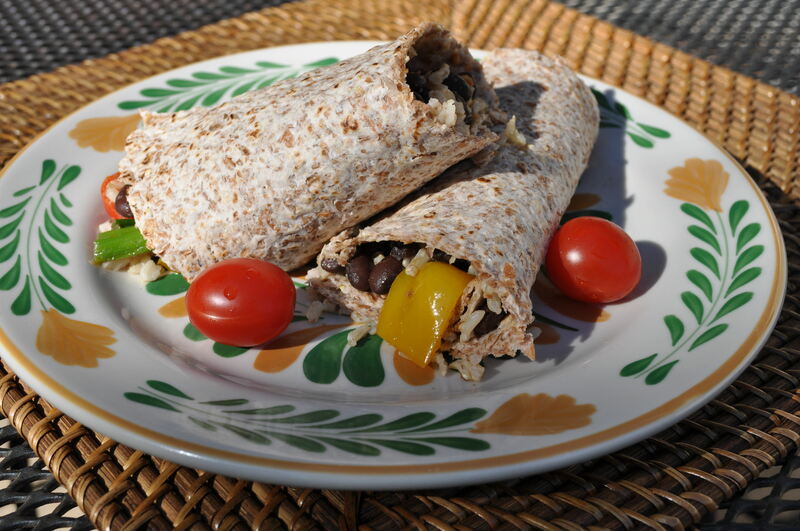 Wrap up in a whole grain tortilla and enjoy! We have the same "issue" in our house . . . my husband and 2 of my kids like spicy food and I, along with one of my sons, do not. I grew up PA Dutch (very bland food), so we always have to compromise :). I make a similar type of enchilada and do two separate 8 x 8 pans--one with hot salsa and one with mild. Recently "found" you on fb and have been enjoying your posts/blogs! Thanks! I have never had funny cake, even heard of it. I will google it today! Maybe I can make a healthy version. You mean you've never been to ren fair? Where do you buy your wraps? I buy Ezekiel sprouted wheat or corn tortillas at Sprouts or Whole Foods. They will be in the freezer or refrigerator section because they contain no preservatives. I have seen them at Kroger too. What kind of fajita seasoning? Perfect! Thank you! I am new to your site and am staring to make a few things. So excited!! You're welcome! I hope you enjoy the recipes. You mention frozen corn in the ingredient list but I didn't see it in the recipe. At what point in the recipe should you add the frozen corn? Sorry that is an old post and I guess I wasn't the best proof reader back then. I would add it at the same time you add the beans. You can freeze the mixture, but not the whole thing.